As we’ve discussed in a previous post, women became an important force in early campaigns for wildlife protection, and in the early decades of the twentieth century more and more wives, mothers, and daughters joined the cause. One woman in particular, Mrs. Charles Cyrus Marshall, went above and beyond to provide bountiful aid wherever it was needed. Though most of Mrs. Marshall’s documented work with state and national preservation may have been created through local action, her projects most certainly had national and historical impact. As a member of the New York State Federation of Women in 1915, she was instrumental in organizing the balloting process related to naming the bluebird as the unofficial (and later official) State Bird of New York. Through her partnership with the Bronx County Chapter of the American Red Cross, she staged a faux plumage fashion show/ fundraiser, which cleverly highlighted stunning alternatives in embroidered and beaded featherless hats. Her ingenuity in staging such an event not only appealed to lovers of fashion, but subtly educated the city’s women of the ease at which one could survive a stylish promenade down 5th avenue without harming our nation’s wildlife. Image from “Audubon Couldn’t Criticize these Hats” (review of the birdless hat show) in Millinery Trade Review, December 1917. 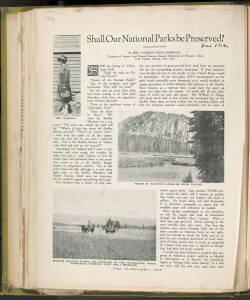 Volume 10 of William T. Hornaday’s scrapbook collection on the history of wildlife protection includes a lengthy article by Mrs. Marshall (by then Chairwoman of the Forestry & Natural Scenery Committee of the General Federation of Women’s Clubs) in which she discusses with great passion her recent visit to Yellowstone National Park and the importance of preserving other similar national expanses. Mrs Cyrus Marshall. 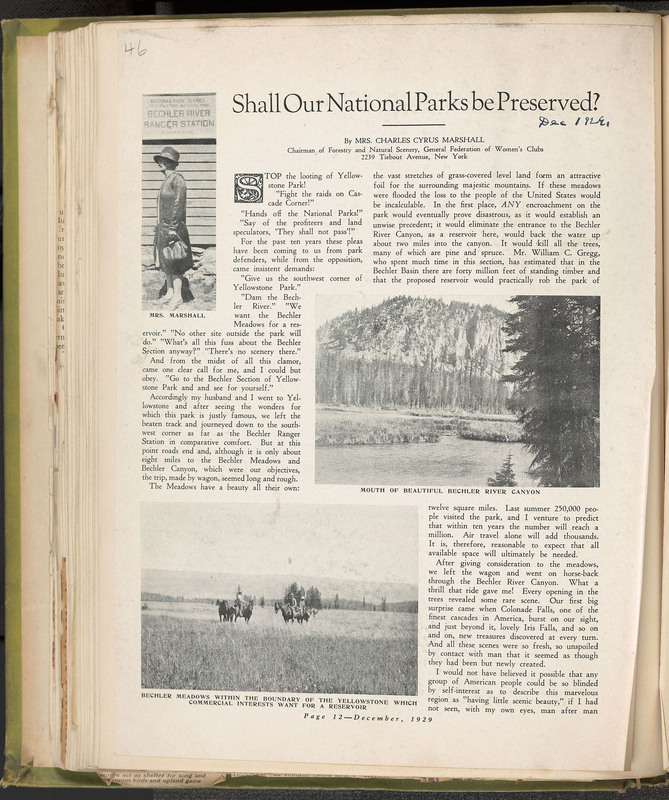 “Shall Our National Parks be Preserved?” In Hornaday Wildlife Scrapbook Collection, Vol. 10. WCS Archives Collection 1007. Women of America, shall we not unite to oppose encroachments, to demand our rights and to insist on the preservation of our heritage from the hand of the spoiler? Mrs. Marshall’s tireless efforts for national preservation would continue for years to come. 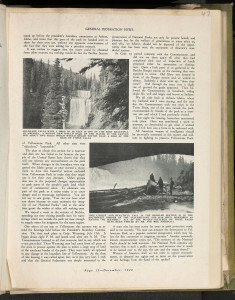 Ever since her visit to Yellowstone, her love for parks never ceased. 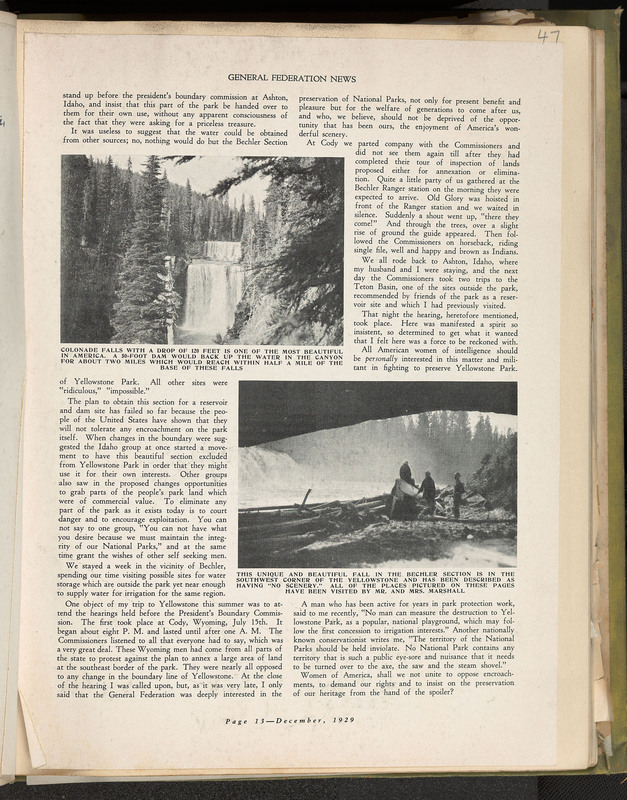 A crusade to educate citizens on the wonder and rarity of Yellowstone’s mass of breathtaking geysers and geyser basins as well as the creation of a memorial forest honoring Stephen T. Mather, long-standing National Parks Service Director, are among her many honorable achievements.